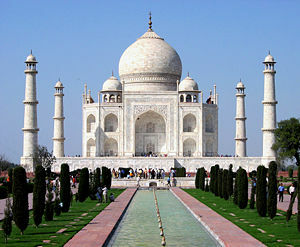 The Taj Mahal in Agra, India is a world-famous monument made of marble. Marble is a metamorphic rock, composed mainly of crystalline calcium carbonate or calcium magnesium carbonate. Used extensively for sculpture and as an architectural material, it has become an icon for refined taste and culture. In addition, white marble is taken to symbolize purity and immortality. Powdered marble is used as an ingredient in paints, toothpaste, and plastics, or it may be added to cement or synthetic resins to produce "cultured marble." The word "marble" derives from the Greek marmaros, meaning "shining stone." This stem is also the basis for the English adjective "marmoreal," which refers to something that is like marble, or someone who is aloof like a marble statue. In addtion, the word marble is colloquially used to refer to many other stones that are capable of taking a high polish. As the favorite medium for Greek and Roman sculptors and architects, marble has become a cultural symbol of tradition and refined taste. In folklore, marble is associated with the astrological sign of Gemini. Pure white marble is a symbol of purity and immortality. It is also considered an ensurer of success in education. The extremely varied and colorful patterns of marble make it a favorite decorative material. These patterns are often imitated, such as in "paper marbling," a technique for producing colorful swirls on paper. "Faux marble" (or faux marbling) is a wall-painting technique that imitates the color patterns of real marble. Marble patterns are also evident in backgrounds for computer displays. Marble is a metamorphic rock, resulting from the metamorphism (transformation) of sedimentary carbonate rocks—either limestone (composed mainly of the [[mineral calcite) or dolomite rock (composed mainly of the mineral dolomite). The metamorphic process, which takes place at high temperatures and pressures, causes a complete recrystallization of the original rock into an interlocking mosaic of calcite or dolomite crystals. Calcite consists of calcium carbonate (CaCO3), and dolomite, of calcium magnesium carbonate (CaMg(CO3)2). The temperatures and pressures necessary to form marble usually destroy any fossils and sedimentary textures present in the original rock. Pure white marble is the result of metamorphism of very pure limestone. The characteristic swirls and veins of many colored marble varieties are usually due to the presence of minor amounts of other minerals such as clay, silt, sand, iron oxides, or chert, which were originally present as grains or layers in the limestone. These various mineral "impurities" were mobilized and recrystallized by the intense pressure and heat of the metamorphic process. Natural patterns on the polished surface of "landscape marble" can resemble a city skyline or even trees. 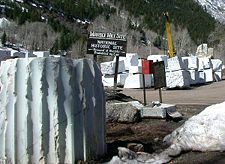 Blocks of cut marble at the historic mill in Marble, Colorado. White marbles, like Carrara, have been prized for sculpture since classical times. This preference has to do with its softness, homogeneity, and a relative resistance to shattering. Also, based on the low index of refraction of calcite, light can penetrate several millimeters into the stone before being scattered out, resulting in the characteristic waxy look that gives "life" to marble sculptures of the human body. Places named after the stone include Marble Hill in Manhattan, New York; the Sea of Marmara; India's Marble Rocks; the towns of Marble in Minnesota and Colorado; and Marble Arch in London. The Elgin Marbles are marble sculptures from the Parthenon (ancient Greek temple) that are on display in the British Museum. Venus de Milo, an ancient Greek statue made of marble. Sculpture is among the oldest of the arts, and sculptures rank among the greatest of human achievements. Marble sculpture is the art of creating three-dimensional forms from marble. Among the commonly available stones, only marble has a slight surface translucency that is comparable to that of the human skin. This translucency gives a marble sculpture a visual depth beyond its surface, evoking a certain realism when used for figurative works. Marble also has the advantage that when first quarried it is relatively soft and easy to work, refine, and polish. As the finished marble ages, it becomes harder and more durable. Limestone is cheaper but less translucent than marble. In addition, the fineness of marble's grain enables the sculptor to render minute detail in a manner not always possible with limestone. Also, marble is more weather resistant than limestone. The finest marbles for sculpture have few or no stains. The skillful sculptor, however, can incorporate some stains into the sculpture. Marble does not bear handling well, as it will absorb skin oils when touched, producing stains ranging from yellow to brown. While more resistant than limestone, marble is susceptible to attack by weak acids and performs poorly in outdoor environments subject to acid rain. For severe environments, granite is a more lasting material but one that is far more difficult to work and less suitable for refined works. Compared to metals such as bronze, marble lacks ductility and strength, requiring special structural considerations when planning a sculpture. Colorless marbles are a very pure source of calcium carbonate, which is used in a wide range of industries. Finely ground marble powder is a component in paints, toothpaste, and plastics. In addition, marble dust can be combined with cement or synthetic resins to make reconstituted or "cultured marble"—a less expensive alternative to natural marble. When calcium carbonate is reduced under high heat, it produces calcium oxide, also known as "lime." 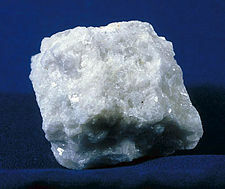 Lime is a primary component of most cements and has many other applications. In the construction trade, the term "marble" is used for any massive, crystalline, calcitic rock (and some non-calcitic rocks) useful as building stone. For example, Tennessee Marble is really a massive, fossil-rich dolomite rock of the Ordovician era. Its color ranges from gray to pink to maroon, and it is called the Holston formation by geologists. This page was last modified on 10 August 2018, at 18:54.